So now that I've joined Rachel and Nichelle in this cupcake blog, you might wonder what I, who document all things Brazilian in New York City, have to do with cupcakes. Well, it turns out that in addition to my love of Brazilian music I also have a love of baking (and food in general), and due to my friends' love of cupcakes, I've become especially fond of baking cupcakes for them. People often wax philosophical over why cupcakes seem to have overtaken cake in popularity (at least here in NYC), and I think people often overlook the obvious practical reason: a cupcake can make the same kind of fancy impact of a cake, but then you don't need knives, forks, and plates to feed them to your friends when you bring them along to a bar or a comedy show or whatever. But whatever the reason(s) we love cupcakes, the important thing is to make them (or buy them if you're a kitchen wimp) and share them and eat them. 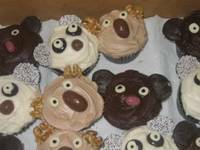 As my first entry to this cupcake blog, I'd like to submit a Gothamist post I did about Clare Crespo's "cubcakes". And since these can't be bought at Magnolia or anywhere else in NYC (unless you pay me to make them for you! ), maybe it'll give you the real inspiration you need to try your hand at baking and decorating cupcakes!